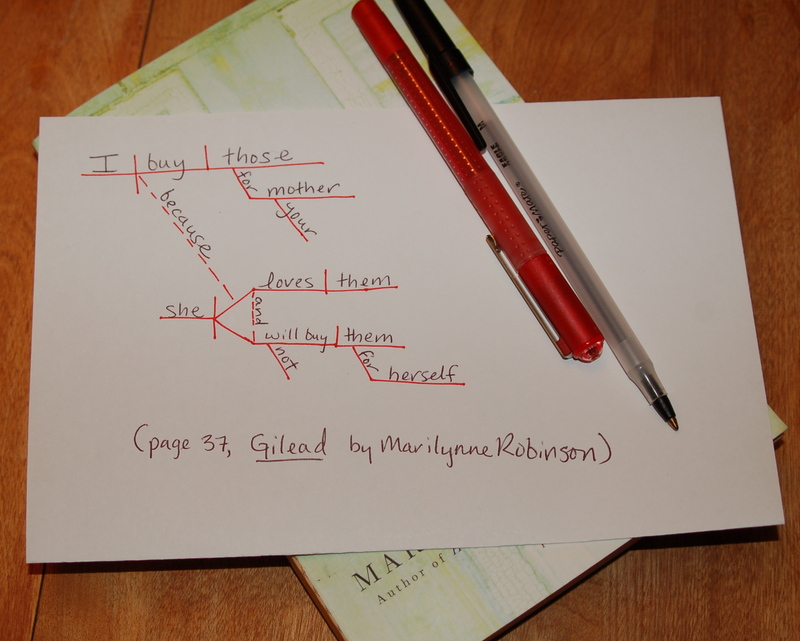 Readathon mini-challenge: Diagram a sentence! Welcome, Readathon-ers! I know you’re probably tired, but this will definitely be a change of pace, which is a good thing. This mini-challenge pulls many fun aspects of a word-filled life together. I love looking at other people’s handwriting, and diagramming sentences was so much nerdy fun in school, wasn’t it? I love the visual representation of how the words of a sentence fit together. And as much as I’m sometimes practically tied to a computer, there’s just something about putting physical pen to physical paper, right? I love the tactile nature of it. Also, this definitely works a different part of your brain, while still being bookish. Win-win! So, diagram a sentence! Go back to that book you’re reading and open it up. Find a sentence, and diagram it! Go on, embrace that inner grammar nerd. Once you’re finished, take a photo and post it to your blog. Leave me a comment with the link. Or, actually, just go to English Grammar Revolution. If you’re of the anti-diagramming camp, perhaps you should start with this New York Times post? OK, hop to! Go forth and diagram! (And then come back and post your permalinks.) In three hours, at 7 a.m. Central time, I’ll close this challenge and draw a winner. Edited to add: This mini-challenge is now closed and a winner has been selected: Anna of The Adventures of a Linguaphile! Congratulations! Thanks so much to everyone for playing along. Hope you had fun. This year, I thought, rather than simply announcing this great day here (I have no reason, really, to get involved in a discussion about the pros and cons of grammar) I’d do something different. I used to listen to Fogarty’s podcast. Have you read any grammar books? NOTE: I’m using a broad definition of grammar here. Punctuation may not exactly be the same thing as grammar, but it’s close enough. If you’re more a person of action, John McIntyre has a list of tasks one can undertake in honor of National Grammar Day. As seen on our recent trip to Florida, on the door of Down the Hatch, a coastal restaurant on Daytona Beach. It shouldn’t need to be said here, but I’ll say it anyway: Quotation marks do not provide emphasis. Rather, they indicate that the material contained therein is being quoted. Hence the name of the marks. For emphasis, many techniques could be effective here. Bold, italics, underline, all caps [when the whole sign isn’t in caps], asterisks around the word, larger font, different font, different color — these are just a few of the options preferable to quotation marks. While I may not *love* all of these options, they’d all be better than quotation marks. The first two books I proofread are now in print! I haven’t seen the final version of either. The first book I proofed: Mongoose in the Sand by Ron Godby. This fiction book tells the story of an elite Marine unit’s harrowing mission. It’s written by a U.S. Marines veteran. Also available for the Kindle. The second book I proofed: The Soul of a Christian University: A Field Guide for Educators, edited by Stephen Beers (Each chapter was written by a different person or persons in Christian higher education.). Amazon is “temporarily out of stock” of this title. This book is a guide to help educators (faculty and staff) new to Christian higher education acclimate to their new environment. I’ve been waiting and waiting for this day! I was just handed (yesterday) a good chunk (not all) of my next proofreading project.